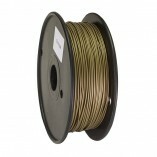 What is metallic filament? 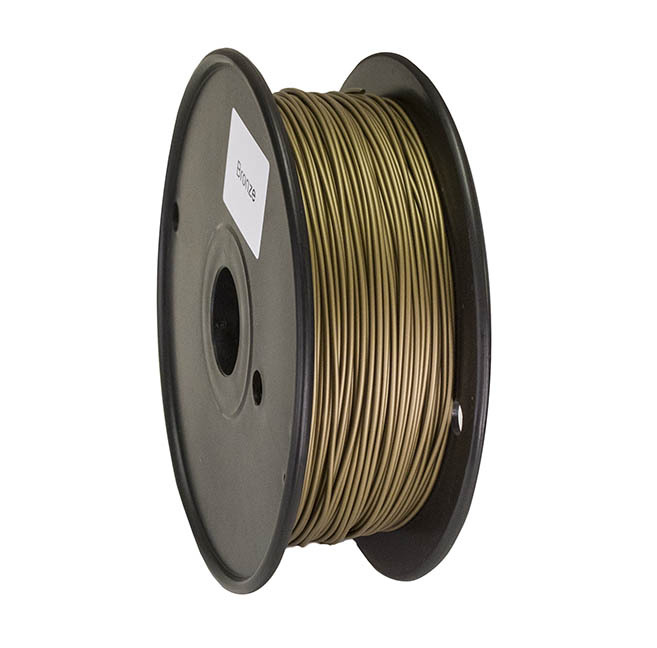 It’s PLA-based filament with real metal; roughly 35% metal, 65% PLA. That means that you can print using most standard 3D printers, with no noxious odors. Print it a bit hotter than our typical filaments. We recommend extruding it faster than average, so that the metallic elements don’t separate from the PLA and clog your extruder. Keep it flowing. Extruder: .4 or .5 nozzle. We don’t recommend printing with a .35 nozzle. Polish with fine grit sanding paper for a smooth surface. We’ve not tested it yet, but others have suggested “copper polish” for the finishing touch. If you print something awesome, send us a pic. If we use the pic on our website, we’ll send you a free roll. We can’t explain how awesome this filament is…so we won’t try. It’s a metal/PLA hybrid that shines like metal but works with most standard printers. It’s awesome. That is all. See below for more info. WOW! Have been using FoxSmart filament for about 2 years as my default filament brand! Have used MANY rolls of PLA over 8, a few of ABS, 3 rolls TPU and a roll of wood. I got a test line of this and i didnt have too high hopes, Metal mixed with PLA yeah great extruder ruiner…. NOPE! Prints AMAZINGLY Well! I Put on a .5mmt tip , printed middle of their temp range, on 50deg lexan bed, 60mm/s speed, went down BEAUTIFULLY! Sands AMAZINGLY Smooth!!! NO smell when printing this that i noticed. I see a few rolls of this in my future, just for the price wish i got full rolls not half. I would pay $30-35 for a full roll. All I can say is I love this filament it rocks! I have used Foxsmart pla for some time now and it’s never failed me yet. so I bought a roll of the copper to give it a try and it looks great. I still have to sand it down just a little and try to polish it like what was mentioned on their web site description. my setting where 210 c at the nozzle and 50 c on the bed with 0.200 hight printing at 60mm per/sec. It does have a heavy feel to it giving it a metal feel. I’m going to send a pic of what I made and hope they use it. I have already ordered more green pla and abs, yellow pla and the clear pla. hoping to buy more soon because their prices can’t be beat thank you for make a great filament. A 8″ T-Rex Skull In copper PLA is amazing! I hape not used any other metalic filaments so I do not have anything else to compare it too, but TFS filament has been flawless. At this point I only buy TFS unless I really need it and they do not have it. That has happen only once. Great job The FoxSmart.